Short summary: Big budget ($200mil), Christian Bale has signed on for 2 other films. Arnold's role is being covered by a look-alike body builder--darn that being governor stuff. Arnold, Jim Cameron, and Stan Winston were consulted. Same writer as the Dark Knight. The film is set Post-Judgement day, giving us a look into the dark post-apocalyptic future that we've all wondered about. The year is 2018--during the beginning of the War of the Machines. Skynet is not as advanced as in the other films--expect big, crude, brutal terminators, not the sleek, ultra-advanced T-1000s or TXs. 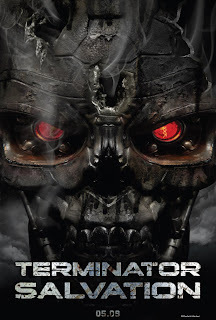 Grim, gritty, "kick you in the balls" fight against Skynet. Highly recommend watching the Comic Con panel footage--McG and the actors talking about the movie for nearly 13 minutes--they're all passionate, excited, and clear in their intentions and vision for the film--which sounds frickin' awesome to me.